I’ve been writing a series about powerfoods for a great new site, Archetype Me, and I wanted to share a few (super easy) recipes I’ve posted there. Go to ArchetypeMe for more recipes and tons of info for athletes, travelers, artists, sci-fi smarties and more. 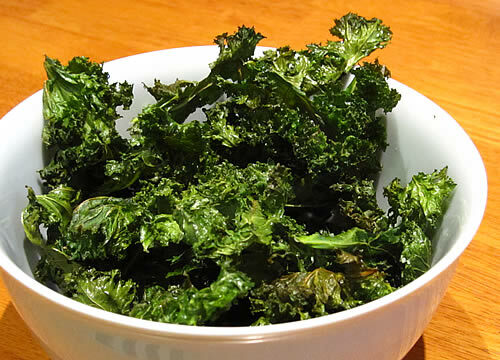 Here is my recipe for homemade baked kale chips. Love ’em! Sometimes in the late afternoon, lunch but a memory, I crave a nice salty crunch — but thanks to the joy of kale, I don’t have to resort to junk anymore. One of the surprising satisfactions about kale chips is their great texture; better still, they taste like they’re loaded with calories and fat — like the addictive snacks we’ve all battled to wean ourselves off. The green queen is the darling of fitness folks and foodies alike, and it punches way above its weight nutritionally. One cup contains (are you sitting down?) 36 calories and 5 grams of fiber — plus 15 percent of daily requirements of calcium and vitamin B6 (pyridoxine), 40 percent of magnesium, and 180 percent, 200 percent, and 1,020 percent of vitamins A, C, and K respectively. BAM! Preheat oven to 350˚ Fahrenheit and cover two baking sheets with a layer of aluminum foil. Wash the kale and dry the leaves. Remove the large ribs and rip leaves in two-to-three-inch pieces. Toss with the olive oil and sea salt to taste, and spread out on the sheets. Bake until crisp, about 20 minutes, turning halfway through. Once the chips are done, combine the nutritional yeast and the onion powder (if you added a lot of salt originally, make that just a dash of onion powder) in a large bowl and toss your chips in the mixture. Voilà. The secret ingredient here is not the kale but the yeast. It tastes a little like nutty cheese — I love it on popcorn, for example — and it’s packed with protein: those two tablespoons deliver 8 grams of it, so adding the yeast to kale equals nutrition heaven, with few calories but a huge punch. I can eat a whole head of kale when I’m snacking. That sounds like a ton, but it bakes down to almost nothing, and the chips pack up wonderfully in a largish Tupperware for work. Just check your teeth in the mirror after eating them, because the green stuff can really rearrange your smile. They’re delish and nutrish — enjoy!